have an almost unlimited storage capacity. The charged LOHC+ can be stored and transported at ambient temperature and pressure. Fuel cells can then be used to produce emission-free electricity from the LOHC+. The discharged LOHC- can be recharged. 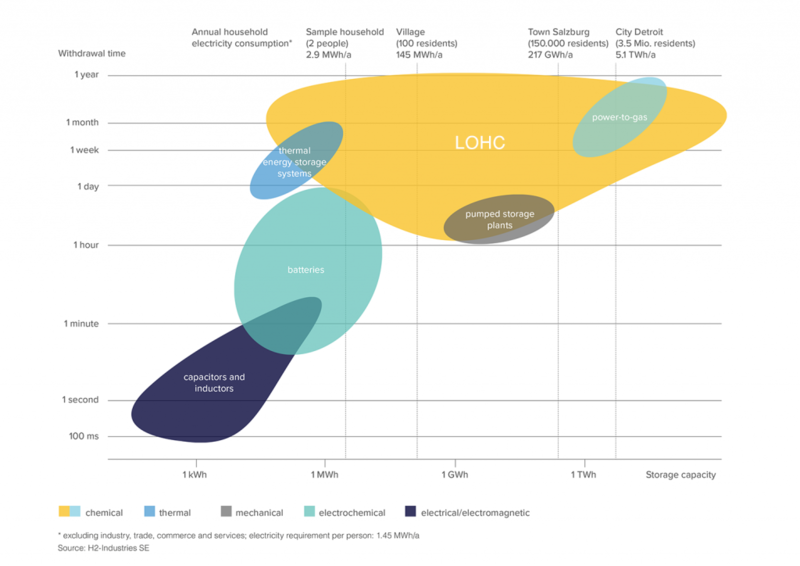 The energy storage capacity of our technology is decoupled from the installed power of a unit (due to inexpensive LOHC tanks), which makes our solution more cost efficient than any other traditional “battery“ for large scale energy storage. Our LOHC energy storage solutions provide solar power around the clock – even at night. With our energy storage technology, wind turbines deliver energy even when there is no breeze. By using our LOHC storage technology, energy is used more cleverly and costs are reduced. Our LOHC energy storage solutions allow efficiently generated solar power to be stored and the generated heat to be used to produce fresh water from salt water. Our energy storage technology allows power grids to be stabilised, unprofitable reserve power plants to be shut down and expensive network upgrades to be bypassed. LOHC technology allows stored energy to be transported to any location using existing infrastructure. Our LOHC generator solutions provide a clean, reliable and uninterruptible power supply. With our photovoltaic LOHC solutions, solar energy can be used to generate clean electricity – even in remote locations. Our retrofittable LOHC solutions provide an emission-free, all-electric ship propulsion system – diesel is no longer needed. Our LOHC technology will enable trains to run without any emissions and to be quickly refueled. Our range extenders allow a significant increase in range and they significantly reduce the load time. Our energy storage technology makes it possible to economically realise large, multi-redundant power plants in the gigawatt range and can replace nuclear power plants. Our sister company Global Energy Trading Foundation GmbH relies on the sustainable concept of H2-Industries to make renewable energy available reliably to anyone, anytime, anywhere. Theenergy trading platform will bring together consumers, prosumers and producers and democratise the global energy trade.